The Digital Electronics Trainers that we manufacture are extensively used in various engineering colleges and industries. These digital electronics trainers are fabricated using high grade components sourced from reliable vendors. 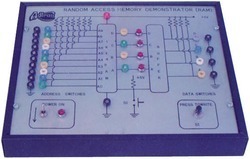 Demonstrates the principle and working of a Random Access Memory of 1 KB x 4 bits. Study and actual feeding (loading) storing and reading of data in RAM. 1K x 4 bit RAM memory chip. Buffer stage to avoid error in loading. 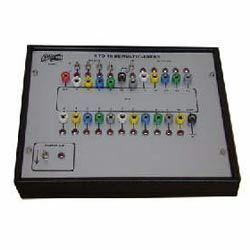 Ten address switches through patch cords. Four data switches through patch cords. Four output terminals with LED’s for reading the called data. Loading (writing or feeding) of data through a press to write switch. 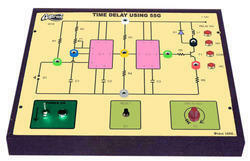 * Demonstrates the principle and working of Time Delay circuit using IC 555. * Built – in IC based DC regulated power supply. * Discharge switch on panel to reset the timer. * Timing range from few seconds to few minutes using a potentiometer. Demonstrates the principle and working of a de-multiplexer. A dedicated 8 channel de-multiplexer ic (de-mux 74138) is used. Facility to select channel and data is provided. 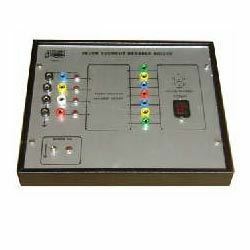 Built-in ic based dc regulated power supply with short circuit protection and led indications for supply “on”. Housed in an elegant cabinet with a well spread intelligently designed circuit layout on acrylic front panel. Strongly supply by a comprehensive instruction manual complete with theory and operation details. Looking for Advance Digital Electronics Trainers ?